American electronic music producer, DJ Marshmello observed a two-minute silence for the 49 CRPF troopers who were killed in the Pulwama terror attack. Pune: American electronic music producer and DJ Marshmello, who's believed to be Chris Comstock but keeps his identity hidden behind his signature helmet of the shape white Marshmello, was on an Indian musical tour with his shows lined up in Delhi, Pune and Hyderabad. Ahead of his show on Sunday night, the Alone and Silence hit music-maker paid respect to those martyred in the Pulwama terror attack, before making his fans dance to his popular foot-tapping tracks in Pune. Tonight was incredible! Thank you Pune and thank you India for showing so much love to not only myself but each other! I love this place, can’t wait to be back ❤️ big thanks to @kartikaaryan for coming out with me tonight! 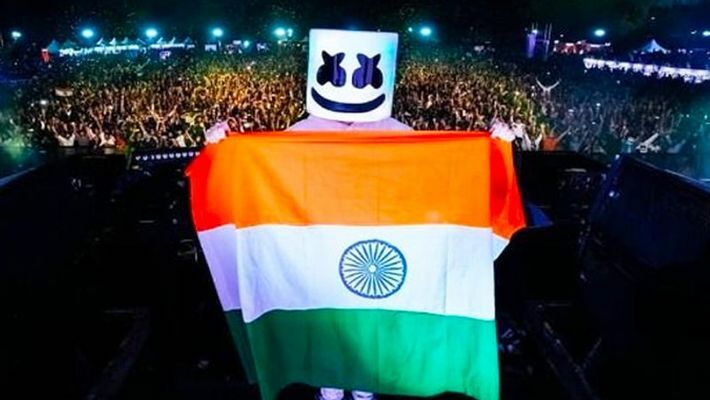 With the Indian flag projected in the background, DJ Marshmello said here on Sunday: "Two minutes silence for the Indian soldiers who lost their lives in a terrorist attack." As many as 49 CRPF personnel were killed on February 14, when a Jaish-e-Mohammed (JeM) terrorist rammed an explosive-laden vehicle into a Central Reserve Police Force (CRPF) convoy on the Jammu-Srinagar highway in Pulwama. A day after the sad incident, DJ Marshmello even took to Twitter to send out his prayers to "those affected by the Pulwama attack". According to reports, a lot of audiences were seen wearing white Marshmello shaped buckets with black eyes and a wide smile just like DJ Marshmello's headgear. Besides his famous numbers, Marshmello also played Simmba song which featured Ranveer SIngh, Aankh marey. Bollywood actor Kartik Aaryan was also seen with Marshmello dancing to his song Coca Cola from film Luka Chuppi. Marshmello even showed some of the dance moves of his latest song Biba which he released on February 14 which he had collaborated with music composer Pritam. In the video, he recreated scenes of the songs from Shah Rukh Khan’s movies in the video, though in a quirky way. The crowd cheering sound was in sync with the beats of his tracks like Friends, Everyday, Silence and Wolves. He also won the crowd's hearts with his twist to songs like We like to party! (The Vengabus) by Vengaboys and Livin' on a prayer by Bon Jovi. Though he had his helmet on throughout the performance and kept his identity a secret, he did encourage the crowd "to make some noise". After his last song, Happier, he thanked the audience by saying: "Thank you guys so much for making it so special. I'll see you next time." The festival also had artistes like Jaden Smith, Bonobo, Anik Khan, Prateek Kuhad, Rudimental and Two Door Cinema Club.